If you really enjoy cooking and you will travel for a few weeks to a distant place, there is always the temptation to carry along some cooking tools and ingredients when you leave the house. For me, a good knife and some dry chiles are a must. Recently, I went to visit a daughter living in Italy where two more of my children living in Holland would join us for the holidays. I was expected to cook Mexican food for them, which in Italy is rather simple. No knives traveled with me this time but I took along some dry chiles that are close to impossible to find in Europe. Italy and Mexico share most vegetables and staples, and our inclination for intense flavors including fiery foods is similar. Italy and Mexico even share the colors of their flags! The same colors found in Pico de Gallo, a “staple” salsa at home. I was not concerned about finding the right ingredients to do my cooking because excellent substitutes abound there. In Italy there is a cheese called Treccia, which is the perfect substitute for Quesillo de Oaxaca, the cheese of choice for Quesadillas in Central Mexico. If you prefer your Quesadillas with the Mexican Mennonite cheese, there is the fresh version of the Asiago cheese from the Italian Alps region. It melts well and the flavor is less sharp than the Mennonite version. If you want to get creative and sophisticated with your Quesadillas, the Mozzarella Affumicato (smoked) is recommended plus adding sun dried tomatoes in olive oil, will do a great job. A real pleasure! And to top it all: Squash Blossoms are found fresh in street markets—still attached to the squash—for all the delicacies you want to create. What can we do about tortillas? It’s not not easy to find Maseca, the popular cornmeal brand in Mexico, but we found a cornmeal made in the U.S.A. that is very popular with South American people living in Europe and it is used to make Arepas by Venezuelans. No problem with tomatoes obviously, there are several varieties for salads but more for sauces. I find Italian tomatoes stronger in taste than the varieties I regularly buy in Mexico, therefore the result is a more intense flavor. Depending on the season, three, four or five types of garlic are found in supermarkets and in street markets. The French variety is the most popular, lighter in flavor than its Sicilian counterpart. I used the French garlic and had to double the amount of that of Sicily to get the same pungency. Fresh herbs are available year round thanks to greenhouses and dedicated farmers. Rice and beans are found everywhere and of many varieties, but for Mexican style rice we searched for a long grain—Thaibonnet—in the Riso section of the supermarket with easy success. For Risotto, we bought a fat grain—Arborio-—that is starchier and the choice of Italians. For beans there’s plenty to choose, pick your favorite color, rinse and soak, and after cooking different varieties you will find one that suits your taste, some being more fibrous than others. One day I felt like adding pork flavor to my Frijoles, so, I purchased Ciccioli, small pieces of fried pork skin with some lard and some meat attached to it. Just like I make them at home, no sweat. Time to talk about chiles. 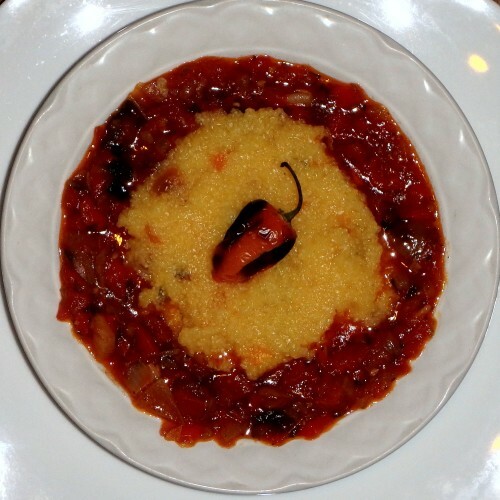 It is almost automatic to think about Peperoncino while talking about Italian fiery food. 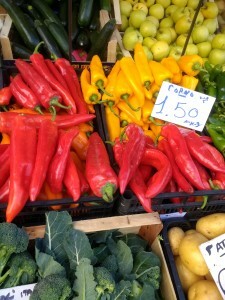 Peperoncini are found fresh red in little bundles in street markets for one Euro (around $1.30 USD) or pay twice as much—and more—in supermarkets. It can be used immediately on a salsa or left hung to dry in a warm and dry area, which in the winter that can be any room with heating. I found it to be the perfect substitute for Chile de Arbol. A chile is called peperoncino (plural is peperoncini) and street market vendors will advise you on request about the heat level of the variety they are selling. Papacella was sold to me bulk in vinegar as “hot” but it turned out not so fiery for my standard, just the right heat for a sandwich. 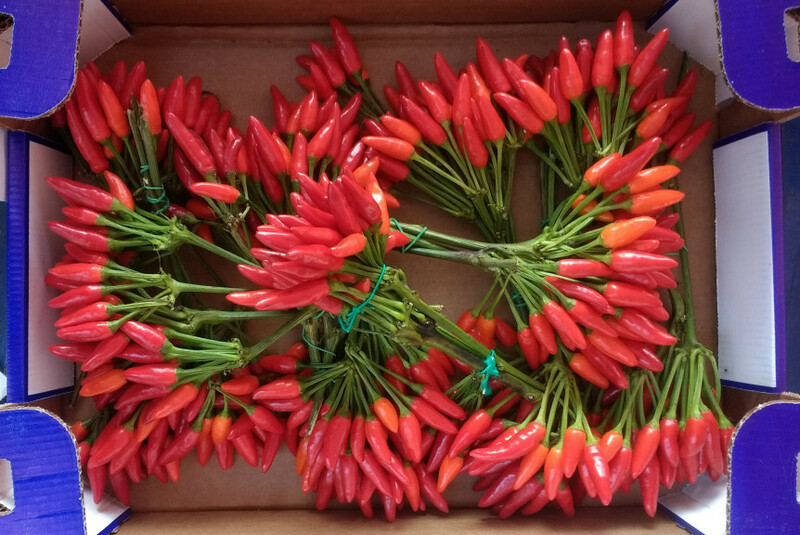 Several Chile varieties from Eastern Europe, Turkey and Asia are available too. But how about “Il peperoncini più piccanti”? Advertised as “The hottest Chiles,” Chocolate Habaneros are available in paste form in a jar, a product from the southern region of Calabria. I felt I had to acquire a jar for my temporary home. The paste was extremely fiery, almost masking the Habaneros flavor. I would’ve deveined them before packing them but I guess no one wants to do that job. I bought 90 grams (3.2 ounces) for around $6.50 USD of 98% fresh Chocolate Habanero ground to a paste and 2% of extra virgin olive oil and salt. Not bad for purity and the super kick! With all this on the options table, we couldn’t complain about variety of flavors, colors and textures. The combinations are extensive and we didn’t hesitate experimenting with Italian fiery food—recipes below. The experience was rewarding to say the least! We invite you to go to Italy without fear of not finding fiery flavorful food, but perhaps you might want to go to Mexico first? Buen Provecho! y Buon appetito! While the rice for risotto in the U.S.A. is bought in a box with instructions, in Italy comes in a plastic bag most of the time without instructions. Follow your instinct. Rehydrate the mushrooms by covering them with hot water for about 15 minutes. Add more hot water to keep them submerged if necessary. Reserve. Toast the rice lightly and uniformly in a thick pan. 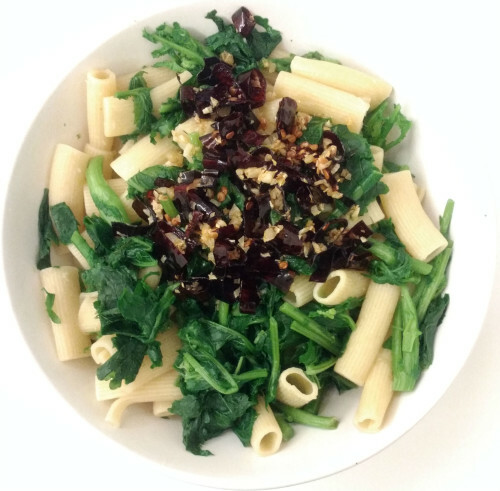 When some grains beguin to change color immediately, add the olive oil or butter. After the oil gets heated or the butter melted, add the onion or leeks and the chopped Chiles, and lightly sautée everything. Add one cup of the stock and begin to stir. As the stock is absorbed add a second cup of stock and the salt. Keep steering slowly. Add the mushrooms with any water leftover from their rehydration. Keep steering. Add more stock as needed until the rice is cooked, it should feel soft. Add the cheese, stir and rest for two minutes. The total cycle should last about 20 minutes. Rigatoni is one of many tubular cuts of pasta with the desirable characteristic of having exterior ribs to provide a surface where the sauce will adhere better than otherwise. “Al Ajillo” is a combination of Garlic and Chile Guajillo lightly fried in Olive Oil. Broccoli Rabe or Raab is a winter vegetable rather hard/fibrous that needs to be cooked a bit longer than most vegetables. Contrary to its cousin Broccoli, the Rabe species is preferred for the pungent flavor of its leaves and stems. This simple recipe works wonders balancing the pungent flavor of the Broccoli Rabe and the garlic/chile combination. You are in for a nice surprise! Boil the pasta per the package instructions. At least five minutes before the pasta is ready, throw the chopped Broccoli Rabe into the boiling pasta pot. It is time to heat the Olive oil and throw the garlic and the Chile Guajillo in a sautée pan. Drain the pasta and Broccoli Rabe, and add to the sautée pan with the oil, garlic and Chile Guajillo mix and toss. Serve and sprinkle the cheese. Enjoy! This is a corn mush with a spicy tomato sauce. Chop the celery, carrots and onion, sautée them in a pan in olive oil until soft. Chop the tomatoes, mince the garlic, and add them to the sautéed vegetables and cover the pan. Add the water and cook over low flame for 10 minutes. As you can tell, no blender was required and the result will be a rough rustic sauce. If finer texture is desired, blend the tomatoes with the vegetables after being sautéed. Add the fine herbs, water if needed and salt. Mix well, cover again and allow to simmer on a low heat for approximately 10 minutes. Check and stir periodically Following the package instructions for the Polenta cook it with the Habaneros.